The High Court has ruled that the UK government acted unlawfully in trying to restrict local governments from instituting “ethical” boycotts on Israel via their pension funds. The case was brought by the pro-BDS group Palestine Solidarity Campaign (PSC). The Department for Communities and Local Government had argued that anti-boycott guidelines for local governments were needed because such actions contradicted UK foreign policy, and because it might undermine community cohesion by legitimising antisemitism. Though the court ruled on purely technical grounds that the government action was unlawful, PSC took a victory lap on the pages of the Guardian yesterday, in an op-ed by their director, Ben Jamal, titled “This ruling allows councils to boycott Israel. It’s a crucial victory”. Anyone familiar with the politically regressive politics of PSC – which includes suspected financial ties with ‘illegal groups’ in Gaza and the well-documented problem of antisemitism among its members – would see through Jamal’s attempt to sell BDS as a progressive movement. Though he claims in his op-ed that the court ruling “is a victory for…freedom of expression”, BDS activists have continuously demonstrated that they stand in opposition to free speech and expression. BDS is not a benign political campaign, but a movement whose leaders are opposed to the existence of a Jewish state within any borders and which attempts to silence and socially ostracize millions of Israeli Jews. Its campaign involves preventing Israeli artists from performing abroad, excluding Israeli professors from academic conferences, bullying Jewish college students who support Israel, chasing Israeli speakers off campuses and targeting Israeli athletes competing in European sports competitions. The movement is so toxic and has such a pernicious effect on its followers that it was revealed in 2014 that a Cambridge University lecturer refused to answer a letter from a 13-year-old Israeli girl asking about horse breeding “until there was justice in Palestine”, out of deference to the BDS Movement. A year earlier, former British MP George Galloway stormed out of a debate at Oxford after he learned that the British student he scheduled to debate, Eylon Aslan-Levy, had Israeli citizenship. BDS groups have even routinely argued against what they refer to as “normalisation’ – initiatives that promote peace and co-existence between Israelis and Palestinians. BDS has at times targeted non-Israeli Jews as well. In 2015, the Jewish-American singer Matisyahu was scheduled to perform at an annual reggae festival in Spain. However, following pressure from local BDS movements, concert organizers told Matisyahu – who is not an Israeli citizen – that he’d be excluded from the festival unless he publicly denounced Israel. After widespread criticism, including charges of antisemitism, organizers were eventually forced to backtrack. 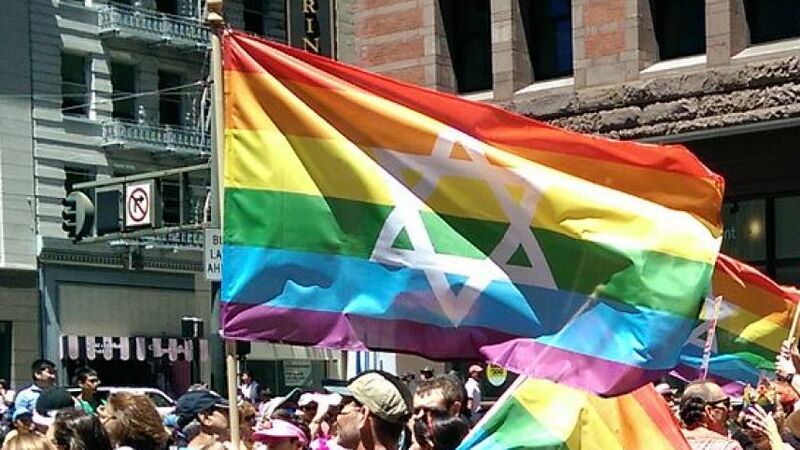 The spirit of BDS was also on display just a couple of days ago when Chicago Dyke March organisers told three Jewish women marching with rainbow flags that included a Star of David (known as a Jewish Pride flag, pictured below) to leave the march because their movement was “anti-Zionist” and the flag made people feel “unsafe”. BDS is not, as Ben Jamal suggests, a progressive movement that champions free speech. It’s a regressive political campaign which silences Jews and consigns millions to pariah status, promoting their social exclusion from the international community. Whilst there is always some danger in using gratuitous political analogies in even the most sincere attempts to characterize the malevolence of anti-Zionists, there’s a passage in a book about the Holocaust which used a darkly evocative term that seems apt. The book, ‘The fate of European Jews’, by Leni Yahil, characterized the effects of antisemitic measures enacted in the 1930s as condemning European Jewry to a “social death” – an idea which resonates when contextualizing BDS’s impact on the lives of many Jews both in Israel and the diaspora. The. New Nazi Storm troupers against free speech and counter thoughts. The only thing missing is their brown shirts and red arm bands. BDS provides justification for the blood thirsty hatred of overt anti-Semites who are in denial of their own fallacies, including their unmanageable propensity to hate large swaths of individuals, e.g. Zionists. In fact, I have yet to meet an anti-Zionist who can define Zionism. Talking to BDS about Zionism is like talking to the Klan about Black Lives Matter. Suddenly, the most ignorant people in the world will care about semantics. Or like talking to BLM about Zionism. Not all of BLM but, yes, there are anti-Zionists attempting to hijack the mission of BLM. But would you talk to the Klan about BLM and expect a serious conversation? BDS wants to replace a Jewish state with yet another Muslim ruled state. It’s not a progressive idea and really not very hard to grasp. Yet people want to pretend not to know this. Discrimination against others is, indeed, a nasty form of “local democracy and for freedom of expression” which is why the civilized world has laws opposing the activities of groups like the PSC. the stupidest comment on the internet. Eh, Stephen’s puked out a very solid baseline of comments that make him sound like his IQ is somewhere between 20 and 22. If you miss one, he’ll be a nice boy and come up with more idiocy in a few days. He’s quite consistent, to his detriment. The Guardian is a socialist rag and despises Western values and cultures. I was thinking. Perhaps a rainbow flag with a representation of the Kaba in Mecca on it to see how the same brain dead people would react? Any Palestinian flag flown at a rally makes me feel unsafe. Does that decision give me the right to ban all Palestinians from rallies?